But no, not at all. I'm out to defend animals from human disrespect and cruelty. I tackle hard cases like Salk and the caveman in order to be a believable advocate for animals. We know it's OK for a starving caveman to kill for food. But why? Another thing we know: when relief workers go into a disaster area, it's right for the first responders to save the humans first. Again, that's a very hard thing to explain, but we need to explain it. Otherwise, the whole idea that animals deserve respect and compassion will start to merge with an implausibly extreme egalitarianism. The discussion of Salk comes from the 8th chapter of Animalkind, which begins with examples of medical research -- the good but also the bad and the ugly. I argue that Salk's research cannot be condemned if we think the caveman's survival hunting is ok. But that's not the main point of the chapter. I give lots of examples of horrific animal research, and I argue at length that lab animals are insufficiently protected under US law. The main point is quite clear -- that we owe much more to animals than we are now giving them, even if they do not have a status exactly equal to our own. Besides the above concerns, I have a quibble or two. O'Connell says the number of monkeys killed in Salk's research was 17,000, but that was just in the first stage. I say the total number was 100,000. She says in the 50s "medicine had not advanced sufficiently to allow virus culture without live incubators." But I point out that by the 50s virus was being cultured in vitro, thanks to the pioneering work of John Enders in the 1940s. Finally, a philosophical point. I ague in the book that different animals are owed different amounts of respect. There's more to respect in a dolphin than in a dust mite, so we must be much more careful to avoid killing dolphins than dust mites. O'Connell worries that if we think along these lines, we'll have to think sophisticated aliens would be justified in using us for food and experiments. Perhaps she sees that as a reductio ad absurdum of my position, but I wonder if she could seriously embrace the egalitarianism she seems to be urging upon me. Does she really want to condemn the caveman, Jonas Salk, and the first responders who save humans first? If she approves of them, why? What makes their conduct not just understandable, but right? My explanation is that there are differences in worth that separate members of different species. It's not pretty to say so--yes, it sounds nasty and elitist. But that may be what we simply have to think, if we are willing to think about it. And yes, if we think that way, then we have to accept that humans could get the short end of the stick if we were visited by super-sophisticated aliens. That's an unpleasant thing to contemplate, but it doesn't seem preposterous. If you're reading the book and have comments feel free...here or by email. 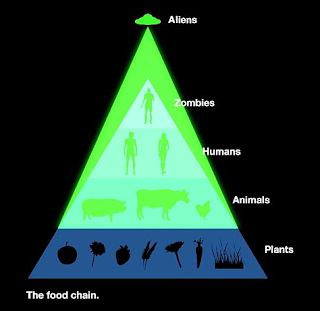 I love your food chain. The "we could be eaten by advanced aliens unless we admit to radical Jainist style don't kill the bugs when you are building your house because they have minimaly sufficient capacity for sentience" is indeed something that, humerously, lurks behind the notion the the larger cranium gets to eat. Certainly it haunts our techno/dystopian cyborg fantasies (The borg, the matrix, even Nozick's utility monster as represented by Huxley's "Brave New World," the list could go on). A strict social darwinism even allows this thinking to apply to intra human relations, and I think in the end this is probably where the action is, so I will be paying close attention to 5 and 6. By the way, I stole that pyramid from another site. I'm not sure what zombies are doing above humans! Glad my book is starting to rise. Yes chapters 5 and 6--I definitely don't want to say Steven Pinker can eat dummies (like me) for breakfast if we're all stricken by a famine. Maybe the aliens can, but not Steven Pinker. You seem to assume that our attitudes towards ourselves and other animals, bugs, birds, and whathaveyou are all developed and measured by an intelligent and kind sort of ethics tool. Some of us feel first and think later, a style I don't have reason to advocate, but I am most familiar with. When I watched on tv the devastation being wrought by Katrina, I had kind and sympathetic feelings toward the victims, but when they showed dogs being abandoned I leapt up, turned off the tv, aghast with horror at this nightmare. No deduction there. The dust mite isn't visible to me, but if it has big round eyes, I might just fall for it more than the dolphin. Peering out of my cave when the snow melts, maybe that wolf's haunch would look delectable. Do I have a point? Not much of one, just that I haven't seen the scale that you're suggesting might determine the amount of empathy a cockroach would elicit in a thinker and I don't think there is such a tool for a feeler. Yes, read your book. Very impressive! yes, an implicit message of the book is that thinking is good. But I don't assume we really do all think things through constantly in a hyper-rational fashion. I just assume we could, and ask how things would fall out if we did. It's good to have a periodic think because sometimes our instincts are way out of kilter with what really makes sense. Also--people sometimes have to agree on one policy, so there's no choice but for them to try to convince each other. Thinking is sort of like getting a tune up for your car every three months. Once you're done, you can go back to cruising mindlessly until it's time for another tune-up! I'm still reading the book, however if I were asked to reduce the main message of those chapters focused on by O'Connell it would be "radical egalitarianism is not the only approach." Apparently this is what O'Connell disagrees with? Does she mean to say that radical egalitarianism is the only approach? Glad I didn't buy that book! If some superior species of aliens were to try to enslave or eat people, I suppose we would have the same right to defend ourselves as any hunted animal does when attacked by the superior species, human beings. Self-defense, whether by a dog, rat, snake or human being, seems so basic that I would not even call it a basic right. Melissa, I'm not really sure what O'Connell was hoping for. I suspect it's somehow just uncomfortable or even politically correct when someone disavows total egalitarianism. Whether she really embraced it, I'm not sure. To do so has lots of weird and hard to live with implications. Amos, Yes, on the face of it there's a right of self-defense we could assert, but the more I think about self-defense, the more I do find it puzzling. We think sometimes people do have a duty to surrender (bad guys are supposed to give themselves up to the police). So it's not automatic that we could resist the hungry aliens! If we really could see that they were right, would we have to go quietly? That's super-counterintuitive, but not obviously the wrong view. I am reminded of rtk's admonishment about thinking too much. Instinct says--self-defense is OK. No doubt if aliens actually land, I will go with that. Jean: I think we argued about self-defense before. There was a post by Jeremy in the TPM blog a long time ago about a group of terrorists who know that they will be executed immediately if they surrender to the police. Should they defend their lives? I argued that it wasn't an ethical question: that self-defense is so basic that I would expect the worst terrorist or criminal in the world to defend him or herself and I would not condemn him or her for doing so. You took the opposite position. The post about bad guys and self-defense.